French police say they have arrested three Italians and a Frenchman over a sophisticated casino scam in Cannes. The Frenchman is accused of marking a deck of cards with invisible ink and ensuring the three Italians played from that deck, reports say. The Italians, meanwhile, wore special lenses to enable them to see the markings, according to police. 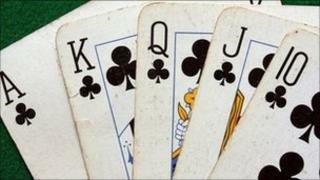 The gang are accused of swindling one casino out of up to 64,000 euros ($88,000; £56,000). But detectives believe they may have used the technique elsewhere in Europe before coming to their attention in France. Suspicions were raised at the Princes Casino in the resort city when the Italians won 44,000 euros playing a form of stud poker against the croupier, then returned earlier this week to win another 20,000 euros. On investigation, the cards were found to have been marked with invisible symbols, including a line for an ace and a cross for a king. "At first we thought they were using cameras, but we didn't find anything," a police spokesman reportedly said. "Finally, we realised that their strategy involved using contact lenses." Other reports suggested the players were using infra-red glasses, not contact lenses. The suspects are expected to face charges of fraud and theft, and could face up to 10 years in jail. But a lawyer for one of the unnamed Italian players was quoted as saying his client denied wrongdoing. His client had "come to the Cote [d'Azur] with a friend to have a good time and only brought a pair of sandals, a towel and a pack of cards, but that doesn't make him a cheat", the lawyer said.